A dental veneer is a sort of fine layer made in ceramic or in composite material that covers the visible part of tooth thus allowing to correct smaller aesthetic problems such as color, form, or even some smaller malformation of teeth. Dental veneers offer a great alternative for other orthodontic techniques since the procedure of placing is very simple and short, and the result of it is a pretty and natural smile. Moreover dental veneers present a quite sustainable solution. 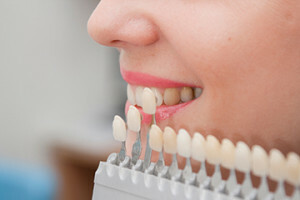 A placement of dental veneers is usually done in two visits to the dentist. During the first visit, the dentist slightly limes the enamel of teeth that is out to be treated under local anesthesia in order to prepare the teeth to receive the veneers. Then he takes an imprint that he sends to the dental laboratory where the veneers are made in way to adhere to the anterior surface of teeth, giving you the smile you have always imagined. At the end of the first visit the dentist makes you the provisory veneers that you will use in waiting for the final ones. 3 or 4 days later the veneers are ready to be placed. Their color matches perfectly with the color of your teeth and they are carefully shaped so that they can transform your teeth into the perfect ones. Firstly the dentist will try on the veneers so that you can see does the color and shape suits you. The veneers will be adjusted as much as time is needed so that you can be fully satisfied. It is about small corrections that are performed on site. Finally the dentist performs the final fixation of veneers on prepared teeth by using the cement. Well made and well adhered, your veneers will be resistant for about 10 years. Placing of dental veneers is not covered by Social Security. In West Europe ceramic dental veneer cost between 800 and 1400 Euros while the price in Serbia is about 275 Euros giving the same or even higher labor and material quality.